In 1995 the Middlewich Heritage Society Newsletter was pleased to announce that the Heritage Society 'had embarked on a programme of marking areas of special historical or architectural interest with cast metal plaques'. 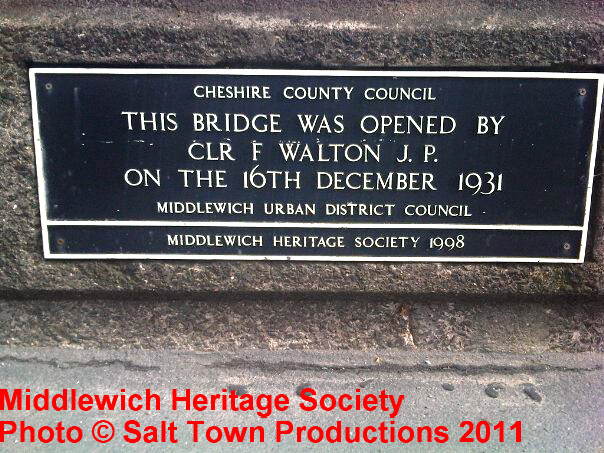 This special one which, as can be seen, was put in place in 1998, was designed to fill the long-empty space where the original bronze plaque marking the opening of the 'new' Town Bridge in December 1931 had been. What happened to the original is anyone's guess (unless anyone reading this can enlighten us?). The general consensus of opinion was that it was either stolen and sold for scrap or that the usual 'mindless vandals' had removed it and thrown it over the parapet into the Trent & Mersey Canal. Personally, I'm inclined to believe the 'stolen for scrap' theory: vandals are notoriously mindless but also usually quite lazy and it's unlikely that anyone would want to go to the trouble of removing something like this merely for the pleasure of making a small splash. Then again, who knows just how pin-headed vandals' minds work? The canal has been drained on several occasions since the original plaque went missing, and there have never been any reports of it being found. I think it's much more likely that it was stolen and sold for scrap. The replacement is actually rather more attractive than the original, and serves a dual purpose with its black-and-white colour scheme marking it out as a Heritage Society plaque and, at the same time, as a replacement for its long - lost predecessor. The plaque, by the way, is actually completely rectangular, rather than wedge-shaped as it appears in our photograph. This is the best I could do: to take the picture properly so as to give the plaque its correct shape would have involved crouching in the middle of one of the busiest roads in Christendom - a risk I wasn't prepared to take. The grey area at the bottom of the photograph, where we have placed the credits, is part of the pavement and is actually at right angles to the concrete bridge parapet.